On-the-water learning takes boater education to the next level with four different on-the-water programs. The first two programs, Jump Start and USPS On-the-Water Guides, don’t require a certifier and can be adjusted to fit the needs of the squadron. The next two programs, Hands-On Training and Boat Operator Certification, require certifiers and give students course credit. The Jump Start Program provides hands-on experience tailored to a boater’s specific needs with personalized training on his or her boat, including departing the dock, basic close-quarters handling, basic on-plane operation and more. Designed to have minimal impact on squadron resources, the program lasts two hours, uses student-provided boats and equipment, and doesn’t require a trained certifier. The program improves new member engagement while promoting classroom and on-the-water training. 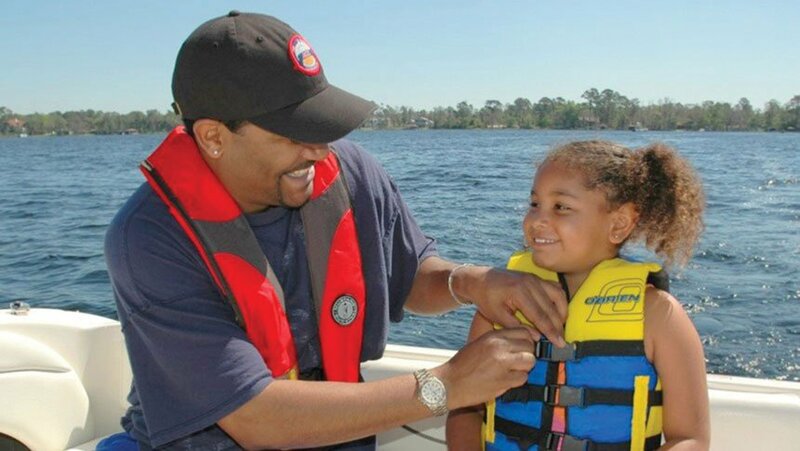 Hands-on Training: Basic Powerboat, formerly the Practical On-the-Water Training Program, includes an updated student guide covering the essential skills taught in the program for powerboats under 26 feet. Future hands-on training programs include the nearly completed large powerboat program as well as sail or paddling, slated for development. In May 2017, we received a $250,000 U.S. Coast Guard grant to establish centers to provide our Hands-on Training: Basic Powerboat program to the public. Look for news on this program in the coming months. Interactive online education teaching technology benefits both classroom and online students, and next generation authoring tools allow committees to produce portable, higher quality interactive versions of our educational products. Our current interactive online seminars include Partner in Command; Boating on Rivers, Locks and Lakes; Hurricane Preparation for Boaters; Weather for Boaters; Planning Your Cruise; VHF Marine Radio; GPS (with a chart plotting and multi-function display orientation); and AIS Electronics for Boaters. Many more seminars are planned. USPS also maintains and updates narrated PowerPoint seminars and courses hosted on the University of West Florida Learning Management System. Funded by USCG grants, United States Power Squadrons Digital Media Library houses multiple formats of digital media focused on boating safety and boater education. DML provides original multimedia content instructors can use to enhance their classroom offerings. Students can view these videos at home for an introduction to boating topics and essential skills as well as to learn what they should and shouldn’t do. “Learn More” links at the end of each video promote USPS education. You can watch the 20 safe boating videos online at uspsdml.org, on the mobile app and on its YouTube channel. You can download the videos from bit.ly/2A9ncCw. Stay connected with the project on Facebook and Twitter. A new video series currently in production includes four videos on various aspects of life jackets, six on personal watercraft operation, and one each on accident reporting, frequently asked questions about navigation rules, visual distress signals, and mobile maritime service identities. Seamanship will be the first course made available in e-book format, with the launch of the Seamanship PDF student manual in spring 2018. After USPS receives an e-book order, a download link and redemption key for each student will be sent to the ordering officer. The student owns the material, can download it for viewing and can print portions or the entire document. The course price, exam process, and squadron account billing structure remain the same, and print copies will be available for those who require them. Most USPS webinars to date have been marine environment-related. Topics covered in the latest webinars—GRIDs and GRIBs: Computer Weather Forecasting and Navigation and Oceanography: Ocean Currents & Computer Navigation—will be part of the updated Weather course. We plan to offer six new webinars in 2018, including one to facilitate use of the HQ 800 system to train new educational officers and assistants in using this important marketing and administrative tool. We’re also planning to include a library of webinars on the national website. America’s Boating Course is due for NASBLA re-approval in 2018. This time-consuming process requires frequent communication and negotiation with state boating law administrators, who need to approve their state’s course content in addition to the national approval. In 2018, the Seamanship course will become the Boat Handling Seminar Series. Squadrons can present the six seminars sequentially as the present course or randomly to meet the needs of its members. The Sail course will receive a similar treatment in 2018–2019. Introduction to Navigation covers planning and navigating basics, taking into account the variety of electronic devices available today. Charting Essentials covers the use of the navigation data derived from charts. Using OpenCPN covers the use of chart plotter navigation software. Traditional Techniques covers the basics of using paper charts and plotting, labeling and dead reckoning. Coastal Navigation provides a closer look at navigating in coastal waters. Inland Navigation covers navigating on inland river systems and lakes. The Practice Cruise brings everything together with students planning a day cruise. Beta testing of an updated Instructor Recertification Seminar will soon be underway. The seminar, required every four years for certified instructors, encourages instructors to think about their teaching skills and to consider different instructional strategies. It also introduces them to current research on learning. Squadrons have already been using online software to teach our courses and seminars, and the Educational Department will develop guidelines to support blended learning for squadrons who want to present courses online. The Educational Department continues to ensure that course materials and presentation methods are up to date and offer real value to both students and instructors. We welcome your support and feedback to help make our courses the best available.